Let’s start with the most basic question: What, exactly, is gold luster? Luster is an overglaze, meaning that it’s applied over the vitrified, glaze-fired piece and requires a third firing. Luster is made of particles of real gold suspended in a liquid medium, usually a pine oil resin. After being applied to your piece, it’s fired in order to burn off the organic binder. What remains is a layer of real, melted gold on your piece. This is very different than gold leaf, which is applied with adhesive and isn’t fired; lusters are permanently fired onto your piece. You can purchase lusters (including gold, silver, platinum, mother-of-pearl, and more) from local clay suppliers and various online sources. If you end up loving the shine that it adds to your ceramics, I would advise checking with your supplier to see if they offer bulk discounts. I use Duncan lusters not only because they work well and are easy to find here in the US, but also because they offer discounts when I order a dozen bottles at a time. Gold luster isn’t cheap, so it’s definitely worth looking into. When ordering, keep in mind that each bottle (1) is tiny—only 2 grams—but it will probably go farther than you think. I’ve read that a single 2-gram bottle will cover a 12-inch tall vase entirely, of course, how large or rotund that vase is would be anyone’s guess. For my use, if I’m only adding gold accents to the flowers on my mugs, I find that the bottle lasts a long time. But, if I’m covering the entire handle on a set of large mugs, the bottle doesn’t last for more than 5–10 handles (2). I use a small brush designed to work with oil paint to apply luster. If you go to your local craft store to scout out the brushes, you’ll notice that they’re divided into sections by size, shape, and the kind of medium that they work best with. Brushes are sized by number, starting with the smallest at 0000 (3) and up to the largest size, 24. The lower the number, the smaller the brush. There are also a variety of brush shapes. I’ve found that a round brush is ideal for evenly spreading luster. So, when picking out a luster brush, look for brushes that are created to use with oil paint, are round in shape, and are about a size 0 (although the size may vary depending on what and how much surface area you’re covering). Tip: Keep your brushes dedicated only to luster use so that they don’t get contaminated with anything else. I used dish soap and paper towels to clean my brushes off after use, and then set them aside to dry. I’ve been using the same 3 brushes for over 5 years, so this method seems to work well for me! Use a properly fitted respirator that blocks fumes during application (4), and work in a ventilated space with plenty of airflow. Luster has toxic fumes when it’s in liquid form. As long as the weather is nice, I apply my luster outside. You can apply luster too thick or too thin (5). If the luster is applied too thickly on horizontal surfaces, you don’t see much of a difference, although you may end up with the occasional crack or bubble in its finish. When applied too thickly to a vertical surface, however, it does drip. I personally love when it drips. I find it to be luscious and rich in appearance, and I often intentionally add a thick dollop of it to the base of my handles or on the tip of a flower so it will run down the pot. A final consideration when deciding how and where to apply your luster is the surface quality of your piece. Gold luster takes on the surface properties of whatever you put it on. This means that if you use it on a shiny surface, it will be shiny. If you use it on a matte surface it will be matte; and if you use it on a smooth surface it will be smooth. For example, if I want to coat the leaves of a flower with gold luster (6), even if I can see the texture of the leaf through the glaze (either because the glaze is transparent or because it breaks over edges), I need to make sure that the texture is actually tactile instead of smooth (in other words, I can feel the texture through the glaze) before painting the leaf with gold. Otherwise I’ll just end up with an opaque, leaf-shaped gold splotch on my mug instead of a golden, textured leaf. 5 The application thickness can lead to spotty coverage (left), full coverage (middle), or luscious drips (right). 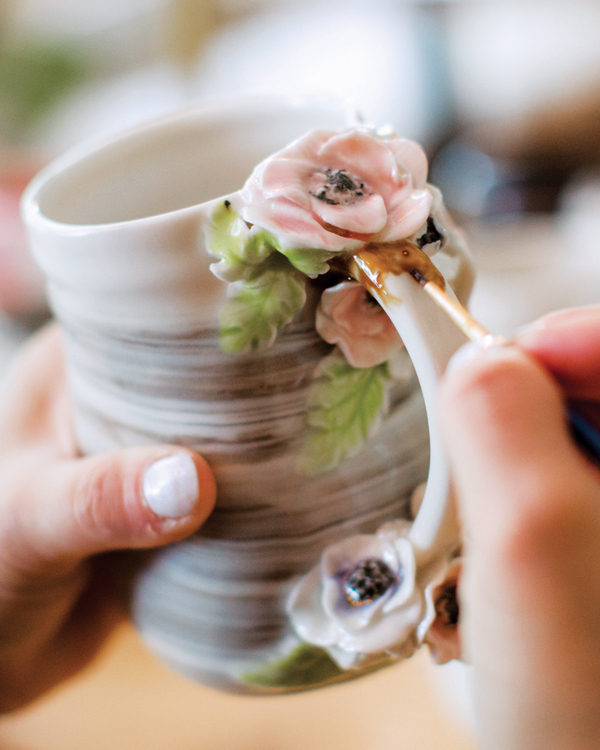 6 Add luster to the edges of small objects to help showcase them on the larger piece. When firing, make sure that your kiln is either isolated away from your living/work space and/or well vented. The first time I fired a luster kiln, I didn’t realize that the fumes from my kiln were leaving the garage and wafting back into our living room window until it was too late, and I ended up with a headache. Cleanliness is of the utmost importance when using gold luster. If you get even a trace amount of the oil on your finger and then touch your piece, you’ll end up with an unsightly purple smudge on your pot after you’ve fired it. I avoid this by only holding my mugs in my left hand, and only touching my luster brush with my right hand, so that nothing cross contaminates. Early on, I assumed that if I fired a piece back up to glaze temperature (cone 6 for me) that the gold would burn off and I could start over. That’s partly true, and may be one solution for stoneware or darker clay bodies. On porcelain, however, there is still a subtly tinted area where the gold once was, so it’s not really a good way to correct mistakes. It’s also an expensive solution. You’re not only paying for the luster, but you are also paying for the cost of another kiln firing for that piece. There is good news though! Mistakes don’t have to last forever. You can order something called luster eraser from various ceramic suppliers, which will help eliminate excess gold or fix mistakes. But, if you want my personal secret, buy Bar Keepers Friend (BKF) (in the powdered form) from the grocery store! Mix a small amount of BKF with water to make a paste, and using a Q-tip, or a toothpick for more fine detail and minimal elbow grease, you can remove the extra luster or eliminate mistakes. I haven’t really found gold luster to be dishwasher safe, that is, it depends on the type of detergent one uses in their dishwasher. Harsher dishwashing liquids can substantially weaken and deteriorate the gold finish. As such, I don’t feel comfortable universally declaring gold luster to be dishwasher safe, and I always recommend hand washing all of my pieces. I’ve had some lustered mugs in use almost daily, for several years, that are hand-washed with gentle soap, and the luster hasn’t washed off. Also keep in mind that this is real gold, which means it’s a metal and isn’t microwave safe. Finally, don’t forget to factor the extra cost of using gold luster into the final cost of your work. Let’s say that you’ve paid $30 for a vial of gold luster and were able to decorate seven vases with it before it ran out. This means that you need to add at least $4 to your wholesale cost for each of those vases and at least $8 to the retail cost for that vase. But, in actuality, you should be adding more than that because you’re also needing to be paid for the application time as well as the cost of a third kiln firing. I hope that this helps you to incorporate gold luster or a luster of your choice into your ceramics. A special thank you to my photographer, Cindy Kane. Marianne Tolosa started working with clay while getting her BA in oil painting, and has been creating ceramics out of her home studio in Virginia for almost a decade. Her inspiration comes from French architecture and backyard gardens. You can see more of her work on Instagram @whitepeachpottery or on her website at www.whitepeachpottery.com. clay, overglaze, porcelain, set, soap, solution, stoneware. Whats the difference in the percentage of gold? Here in France I can buy gold lustre at 8%, 10% and 12%. I have a question that was not addressed on the safety of some of the luster glazes after firing. I think gold and silver has long been used on food bearing items and considered relatively safe, But what about the Mother Of Pearl. I have recently seen it being used on items used for food covering the entire outside including the rims of cups and I was always told that Mother Of Pearl was toxic and could not be used on items coming in contact with food at all. Has this somehow changed and it is now considered safe. I ask only because it is very popular and I want to use it but I also do not want to be poisoning my buyers.